Tile/Pottery Painting - I am endlessly inspired by mosaics, tiles, and things that are generally way too expensive to put in your house. My thinking is that if I got good at painting and glazing tiles the way I liked, I could afford to make an amazing floor in my future home. I could also customize some pretty great dishes. I wouldn't mind actually learning pottery and ceramics but for now I'm good with the painting end of things. Perfecting Soft Pretzels - A soft pretzel has to have a crust, you know? You absolutely have to rip it open with your teeth. It isn't all that soft. It needs the almost bagel-like outside. Mine always turn out like glorified yeast rolls and that isn't okay with me. I need to learn this art because several weeks ago I had the epitome of a perfect pretzel, and it was made by home cooks at a farmer's market. It is an attainable skill. Fashion Illustration - I will, by tooth or claw, manage to get the proportions correct. I find it so difficult to decide what to omit or what to exaggerate or how on earth you draw a leg that long without second-guessing your sanity. Also on the art-list is learning portraiture...otherwise dubbed, "How to draw your friends without alienating their affections." Low-Light photography - I am endlessly inspired by the photos of food bloggers/stylists such as Eva Kosmas Flores, Beth of Local Milk, and Rebecca Gallop. I'm not sure how their photos get that pewter, earthy flavor, but I adore it. Maybe the light comes differently into their homes/studios? All I know is that my house faces due West and there is ever a honey-like light pouring through. Contouring - I feel good to go with my lipstick and eye-shadow know-how. What I don't understand worth a lima bean is how to contour and "do the face." Though I don't like using much makeup on my skin (because I feel that it would just clog things up more than naturally happens) I want to know how. So one day when I have a red-carpet occasion, I'll know what the heck I'm doing. Glass-blowing - I know the art museum in a town not so far away does glass-blowing demonstrations. I actually know a girl who conducts the demonstrations. 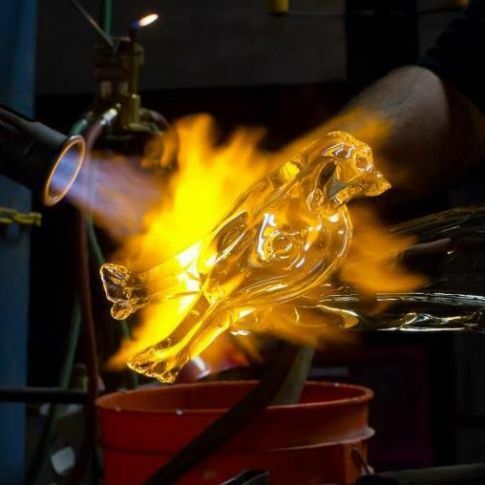 I'm not sure what I would hope to make by learning how to blow glass, but I think it would be worth it simply to hold that glowing, orange, molten glass on the end of a stick and help something form. What are some skills you'd like to try? Those would all be such lovely things to learn. I want to be bilingual. I would also like to perfect cat eye, and learn to play the guitar. Perfecting the cat eye - ugh. Such trouble. 1) Singing. I've always wanted to learn to sing well. 2) Dancing. Specifically tap dance and line dance. 4) Self-defense, like martial arts or something. Self defense is a great one! I love lists like this! There are several skills I know I wish I had: I've been wanting to take ballroom dancing for years, as well as violin lessons. Self-defense is another one, and while I own a bow and arrows, I haven't had much of a chance to perfect my archery skills. I also need to get back into working on my ability to embroider and crochet. Yeah, I to have know end of ideas of skills (Jane of All Trades), but very little motivation. Also, I have been trying to figure out which ones I really want/need to learn. I understand the feeling! So just choose one and do it! You'll never regret learning a skill. Don't wait for the perfect choice! I loved this post...and my mind got to working on your photography question...they're probably making use of reflectors and post-processing color adjustment to achieve their effects. Anyway, I am fairly competent at most of the things I like to do. But it would undoubtedly be useful to become a more accomplished seamstress. And becoming graceful and assured at some form of dance would also be great fun. Ah, thanks for the tip, Janie! 1) Dancing. I have no clue. But I wish I did. 2) Whistle on my fingers. It looks so fun! Whistling on the fingers would be very VERY useful. My mother can do it. I know what you mean--it's just so hard to draw actual realistic-looking people! For some reason, I just can't seem to get the feet right. (Or the ears.) That's one reason why I love writing so much--I can verbally describe the people I see in my mind way, way better than I can draw them. What do I want to learn how to do? Mmmmmmm . . . I want to learn Spanish. And I really want to learn photography - a bit like yourself with this one. Ratty & Mole Gift Exchange!